Installers are being encouraged to take advantage of the opportunities surrounding the recent launch of the Renewable Heat Incentive (RHI) by leading certification body NICEIC. Domestic RHI, which the Department for Energy and Climate Change (DECC) launched in early April, gives private householders access to financial assistance if they convert their heating systems to green or more sustainable energy sources. These include Air Source Heat Pumps (ASHP), Biomass, Ground Source Heat Pumps (GSHP) or Solar Thermal Hot Water. As with the Feed in Tariff, which deals with renewable electricity generating technologies, only those householders whose installation is carried out by an MCS approved installer fitting MCS approved products, will be able to access the financial incentives. “RHI represents a massive opportunity for installers,” commented Paul Collins, Head of Operations at NICEIC, ”Particularly those in the heating and plumbing community who are looking to diversify their business into green technologies and increase their potential revenue streams in the renewable market. To be eligible for the RHI householders will have to have a Green Deal assessment* and ensure their property meets the minimum energy efficiency rating so that it would benefit from Air Source Heat Pumps (ASHP), Biomass, Ground Source Heat Pumps (GSHP) or Solar Thermal technology. So for those specialist companies who are already MCS and/or Green Deal/ECO certificated, or are looking to go that route, it is a potentially lucrative market. NICEIC can offer a range of individual or group certification packages for contractors looking for MCS and Green Deal/ECO approval. “The process to become MCS, or Green Deal and ECO certified has never been easier and our range of packages mean firms can gain certification for all three in one simple assessment,” added Collins. On April 23rd, Installer Online held a live #InstallerASK Q&A session with WaterSafe’s Danny Davis about rogue traders within the industry. 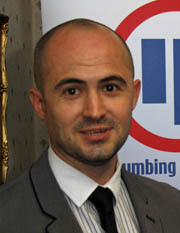 Danny is a fully qualified plumbing and heating engineer. Danny is a member of the CIPHE, registered as an Engineering Technician with the Engineering Council and recently received the Master Plumber Certificate. He has also appeared on national and local radio, and has acted as an expert on BBC Rogue Traders. How can you avoid rogue traders when it comes to hiring a plumber? Danny: Professional qualifications and experience are vital – WaterSafe membership demonstrates these. How much business do you think qualified, competent traders lose to rogue traders each year? Danny: A considerable amount. Rogue Traders don’t have the overheads of professionals and can undercut them. Unfortunately many consumers are driven by price and aren’t aware of the dangers of using Rogue Traders. Do you think customers are aware of the risk of using unqualified installers? Danny: No. Many consumers are unaware of the potential dangers associated with poor plumbing practice. We need to raise public awareness of WaterSafe and the importance of using plumbing professionals. How can Installers become WaterSafe? The director of a building firm has been fined for falsely claiming to be NICEIC registered. Dorset based James Hewitson, a director of Poole Bay Building Construction Ltd, pleaded guilty to offences under the Consumer Protection From Unfair Trading Regulations Act 2008. He was misusing the NICEIC logo on two vehicles and on the company’s website. The action was taken by Dorset Trading Standards following information passed on to them by NICEIC. It is the second recent prosecution for misuse of the NICEIC logo. In January this year London based David Taylor, who trades under the name of DT Property Maintenance and Electrical Contractors, was found guilty of leaving jobs unfinished and homes unfit for human habitation whilst claiming to be NICEIC registered. NICEIC’s CEO Emma Clancy said: “We take misuse of our logo very seriously and we welcome this latest prosecution. “The NICEIC name is associated with quality and we must protect those contractors who are legitimately registered with us and have the quality of their work assessed on a regular basis. Contractors caught falsely claiming to be members will be named and shamed on the NICEIC website and their details passed to Trading Standards. Anyone who is suspicious of a contractor falsely claiming to be NICEIC registered should check the NICEIC website at www.niceic.com which contains a full list of all those contractors registered with NICEIC. Alternatively consumers who are concerned about a contractor who is claiming to be registered when they are not, can contact the Citizens Advice Consumer Service on 08454 040506 for advice and to report the matter. RHI for the domestic market launched on April 9. The Domestic Renewable Heat Incentive (RHI) is the world’s first long-term financial support programme for renewable heat, offering homeowners payments to offset the cost of installing low carbon systems in their properties. The payments are delivered in 28 quarterly instalments over seven years, and are calculated through the heat that the new technologies generate. D-RHI is targeted at, but not limited to, off gas grid households to incentivise a shift from oil, LPG and electric heating to renewables. Installers who want to carry out this type of installation work under the RHI scheme, will need to gain accreditation. APHC offers both Green Deal and Microgeneration Certification Schemes. For consumers to claim under RHI, the installer and the product must be MCS certified and the installer must be a member of the renewable energy consumer code (RECC). If a non-MCS certified person fitted the technology, it would not be eligible for the RHI payments.